A look at the lives of the members of one family living in New York in 1995 as relationship drama causes contention between them. We feel like we say this a lot, but it's the truth: intimate slice-of-life dramas and independent filmmaking go hand in hand, almost to the point that it's now a cliche. 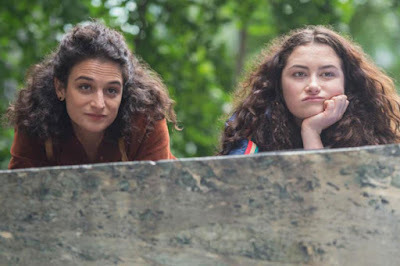 This flick is directed by Gillian Robespierre, who previously made a gem of a movie called "Obvious Child," starring Jenny Slate. We thoroughly enjoyed that picture, so we wanted to seek out Robespierre's second feature film to see if it would be as good as her first. "Landline" revolves around the Jacobs family, who live in Manhattan in 1995. Pat (Edie Falco) and Alan (John Turturro) have a teenage daughter named Ali (Abbie Quinn), who specializes in being a combative, rebellious teen. Ali has an older sister named Dana (Jenny Slate), who isn't always around since she's living with her fiance Ben (Jay Duplass). Ali doesn't really get along with her sister or her mother. The only person she gets along with is her father, but these relationships change when Ali learns that Alan has been unfaithful to her mom. Drugs, spying, insanity, and hilarity ensue, and all without the assistance of cell phones or the internet. Slice-of-life dramas are so prevalent that it's now hard for each film to stand out in an already overcrowded genre. What it really boils down to is, do we, the audience, care about the characters and the situations we are presented with? Do we feel these characters are worthy of our time and attention? In the case of "Landline," unfortunately, the answer is mostly no. Infidelity is one of the most frequent threads and biggest tropes in cinema, not just in independent films, but in all Hollywood stories (particularly romances). When it really comes down to it, this film doesn't do much to separate itself from the pack. The characters aren't all that likable. The situations they go through are ones we have seen time and time again, even several times this year. Luckily, not all is lost as the acting is solid for the most part. We really like Jenny Slate and think she is a very funny, talented actress. She is definitely the strongest part of the film for us. Edie Falco and John Turturro also do a good job as a married couple with a dam's worth of distance between them. 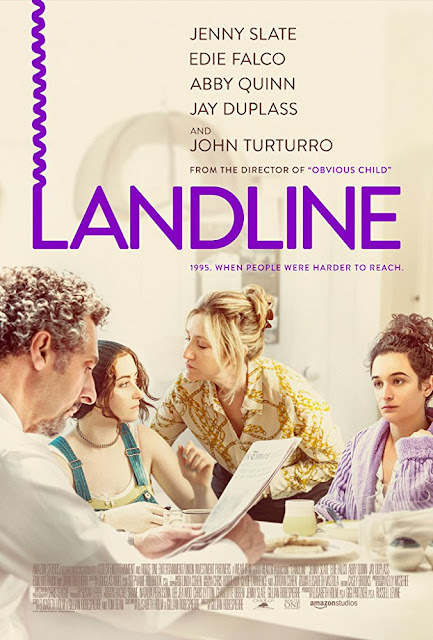 Don't get us wrong, nothing is the matter with any of the technical aspects of "Landline." It is just a story we have seen before, and there's only so many different ways to tell it. Overall, the story just isn't that engaging or interesting. In the end, apart from a couple of sparse funny moments and an eventually loving exploration of a sisterly bond during a time of familial crisis, "Landline" falls in line with dozens of other forgettable movies just like it.